The Vamps made up of Brad, James, Connor and Tristan are the ones to watch out for this year! They are rapidly becoming the next big British (boy)band with their legion of loyal teenage fans supporting them endlessly. They have created quite a stir in the UK and America and were recently crowned MTV’s Brand New for 2014 winners. 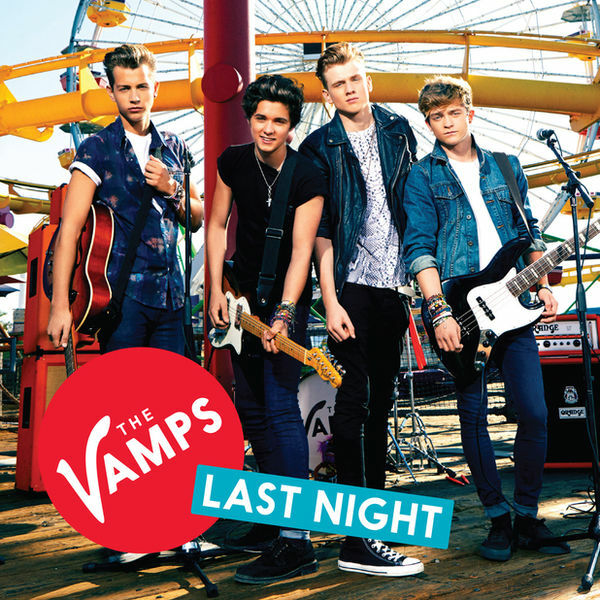 After their success with ‘Can We Dance’ and ‘Wild Heart’ charting in the top ten of the UK single charts, The Vamps are back with ‘Last Night’ which was released…last night (What a coincidence). Last Night is one of those immediately catchy songs which has you singing … and if you’re like us dancing around your room and mumbling the lyrics for hours afterwards. The instant ‘oh, oh, oh’s’ put you in a great, feel good mood and Brad’s cheery up beat vocals leave you wanting to listen over and over again. “Wake up in the morning with the sunlight in my eyes, no my head don’t feel so bright, what the hell happened last night” sets up a light hearted and care free party vibe and teamed with the video, leaves fans wanting a night out with The Vamps. Fans of the quartet were also ecstatic over the addition of vocals from Bassist, Connor – although his vocals are difficult to tell apart from lead-singer Brad. Whether you are a fan of The Vamps or not, Last Night is just one of those songs you will instantly be singing along to.